We have produced a white paper about the current crisis within the Disabled Facilities Grant (DFG) funded home adaptations. The paper asks the key question: Are older and disabled people getting the help they really need? The Disabled Facilities Grant (DFG) funds home adaptations for those who need vital improvements to their home to make it safer for them to continue living independently at home – and primarily covers bathrooms, toilets, stairs and kitchens. 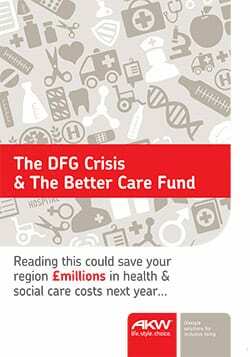 Research carried out in 2011 found that only 10% of the DFG funding required to meet current needs was available, which is not only major a problem currently, but doesn’t bode well for the future. There is little doubt that in the UK, we have what can be described as a ‘demographic time-bomb’. According to projections (taken from stats found in the 2011 Census for England & Wales) in 20 years’ time, our population will have an extra 2.8 million people aged 60-74 and an extra 3.6 million people aged 75 and over. This will undoubtedly put a strain on our health and social care resources, meaning that even more people will not get the care and facilities they need. This makes us ask yet another question… What is the true cost of neglecting the most basic need for a safe home environment? When it comes to where money could be spent most wisely, the stats speak for themselves. DFG funded adaptation costs are usually much lower than the home carer costs they eliminate the need for, meaning that for every £1 spent on home adaptations, £4 could be saved in home carer costs and for every typical home adaptation cost (average price £7,000) could delay entry into a care home by up to 4 years, saving up to £73,000 per person. The findings are clear and the solution is simple, placing additional funds into DFG funded home adaptations will not only save millions of pounds, but more importantly will mean that a greater proportion of the population will get the facilities they need to be safe, comfortable, independent and happy in their own homes, reducing the need for carers and residential care.